She's a mother-of-two and the older sister of fitness model Tammy Hembrow. And on Friday, Emilee Hembrow hinted that she's on the hunt for a new home in Queensland. 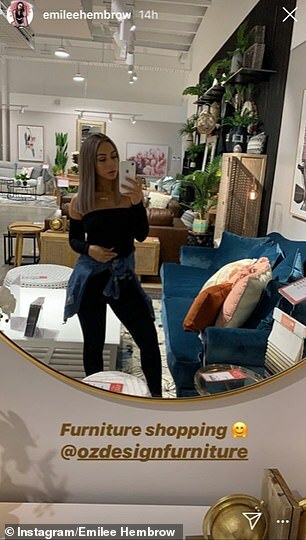 The 27-year-old took to Instagram Stories to share her day furniture shopping with baby son Gabriel, nearly three months. The brunette appeared to joke that she was in the hunt for a new home, writing: 'Now time to shop for the new house,' alongside a laughing face emoji. 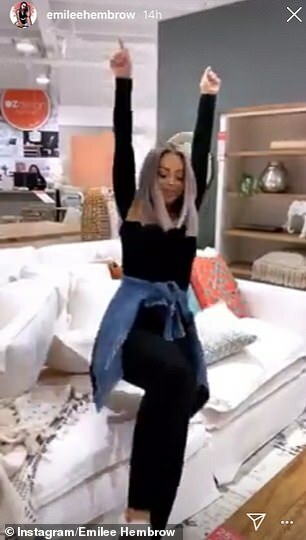 Emilee spent a significant part of Friday shopping at OZ Design Furniture in sunny Queensland. The vlogger was dressed to impress for the outing in a strapless black jumpsuit, a denim jacket wrapped around her waist and Louis Vuitton sneakers. Emilee's locks were styled straight and in a centre parting, and her facial features were enhanced with a glamorous makeup palette. Little Gabriel, who was born in mid December last year, looked cute as a button in an abstract onesie and matching socks. In true Hembrow style, Emilee made the most of selfie opportunities in-store, as she perused the brand's line of mattresses and sofas.